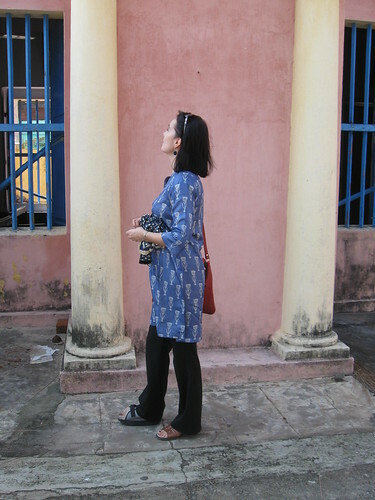 I limped through Christmas with my Mom and a couple of torn ligaments in Pondicherry, India, taking in sights and scents and colors juxtaposed unlike anywhere else I’ve been. It was painful and exhilarating, gave me a rumbling stomach and a sore head. It blew away my fears and preconceptions. I met some fascinating new people. Tried delicously authentic versions of familiar foods. And I can’t wait to go there again (soon, I hope). Why do I travel? Well, for these reasons – but also a whole lot more. One recent morning I woke with a gasp as a motorboat buzzed past my room on a Thai canal, tears streaming from my lashes. Released from a dream of a prison, I focused on the walls of latticed wood and patterned glass of the teak house where I’d slept and could breathe again: I was free. Freedom. It means something different to everyone. In America as with so much else the word has been overused and distorted and mythologized then assumed that every culture worldwide wants the Pentagon’s vision of freedom, when it is more often simply a lust for status and the latest pair of Pradas. When people ask why I’m such a ravenous traveler, I’ll say I ?gather new ideas? [the many Liberal Arts reasons go without saying.] I have left boyfriends, cities, and jobs to study and research art and culture in Europe and Asia. These days I leave my husband for up to six months a year. The exhilaration of planning a trip in advance, or the spontaneity of a a few days in the jungle is intoxicating. I’m not alone ? travel is a trillion dollar industry that’s growing every year. But one driving reason behind why I travel? Because it is only while riding a train, taking a ferry, or boarding a plane that I am free. And those who appreciate freedom most are those who have been denied it. I am in no way comparing any of my thirty-odd years to the many I have met in Southeast Asia who have suffered much more. Some people desire to break the spirit of others, with whatever it takes. Like they would break a horse. They try to tame another person by shoving them into a box and dangling the key. And they gain satisfaction from asserting physical and emotional control over others. For my first nineteen years I was locked in a [metaphorical] box, first by others, and later by myself ? I was unable to see an alternative to what surrounded me. To escape, I painted and turned to books and pictures of other worlds, other times ? I saw no inspiration in the present. You can still see this influence in my work, in the archaic photo processes I use and nostalgic imagery. Eventually, after years of working to pay for an art degree, I designed my own study abroad program and experienced the addictive high of taking a train with little idea of what ? or who – waited at the end of it. Walked into museums with famous paintings whose colors were those of the landscape out the window. Learned how to turn men down in three languages. By leaving my home culture my assumptions were shaken to the core. I began to taste the world for the first time. How many smells and colors, artworks and parasites and smiles it had to offer, all beyond my wildest dreams. And I wanted more. This was the life I wanted. Like a starved creature, I had already missed out on nineteen years of living, and wasn’t going to miss another. Perhaps once I’ve matched those nineteen years with nineteen of freedom, my hunger will have been sated. For the past few years I’ve been searching for a home base ? even if I’m not there year-round. And I may have found something like it. In the meantime, the world awaits. Previous Post Happy New Year from Melbourne! Traveling without adversity makes for a good trip and nice photos, but gives little of interest to a reader. You always seem to take adversity and turn it on its ear, making it something else, something wonderful. I am imprisoned by a day job, expectations, and responsibilities. Vacation is limited by how many days off the company allows or I am punished by not getting paid. I can’t wait, in the meantime, enjoy your blog. This is beautiful. Someday I hope the two of us can sit without other distractions and have the kind of conversations that our blogs have between them! It’s good to know what you seek with as much clarity. Brings so much meaning and richness to life. For the same reason you travel, I work in a cross-cultural environment, never with a group representing less than 5 or 6 different nationalities. I ‘find’ myself in differences, not in sameness. The variety of people and all the levels at which I can connect with them despite the differences helps me reaffirm myself. that’s about as good a reason to travel as any.